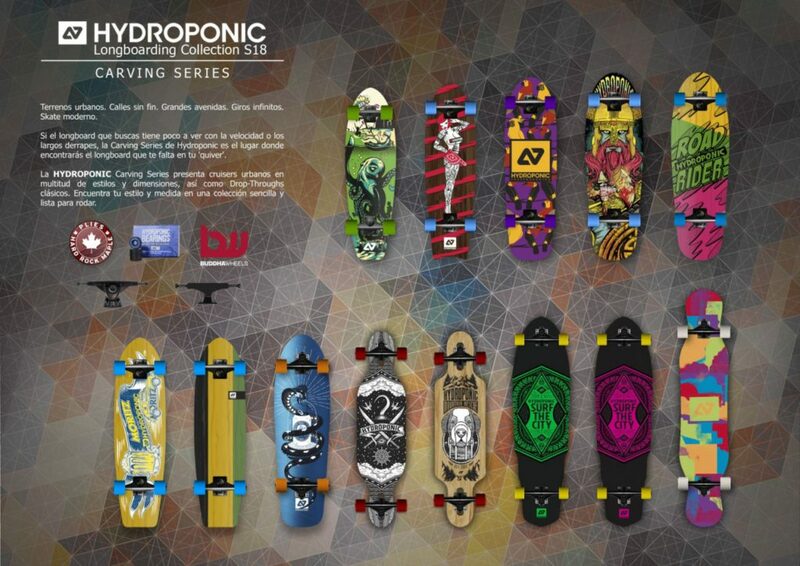 This is a new Season of Longboards and Cruisers at the Hydroponic camp, filled with a variety of shapes and set ups that will make everyone happy whatever your choices are. Surf Skates are the hot item right now, since their popularity keeps rising day after day thanks to an exciting technique and the popularisation of the carving mode. 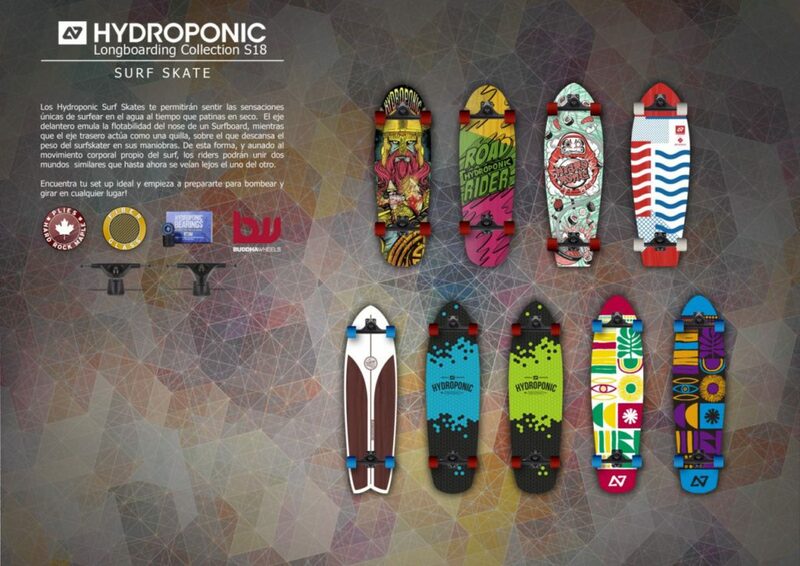 The Hydroponic Surf Skates use Charger X trucks, which do not rely on springs but on a well-designed truck shape that allows you to fully carve while gaining speed constantly. 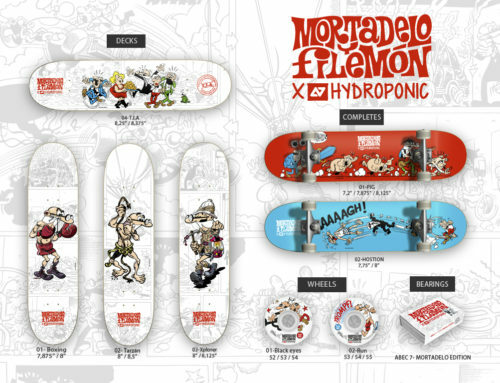 Find your favourite deck shape and size and start pumping! -New bigger shapes join the returning Downing,Trento and Damba models. 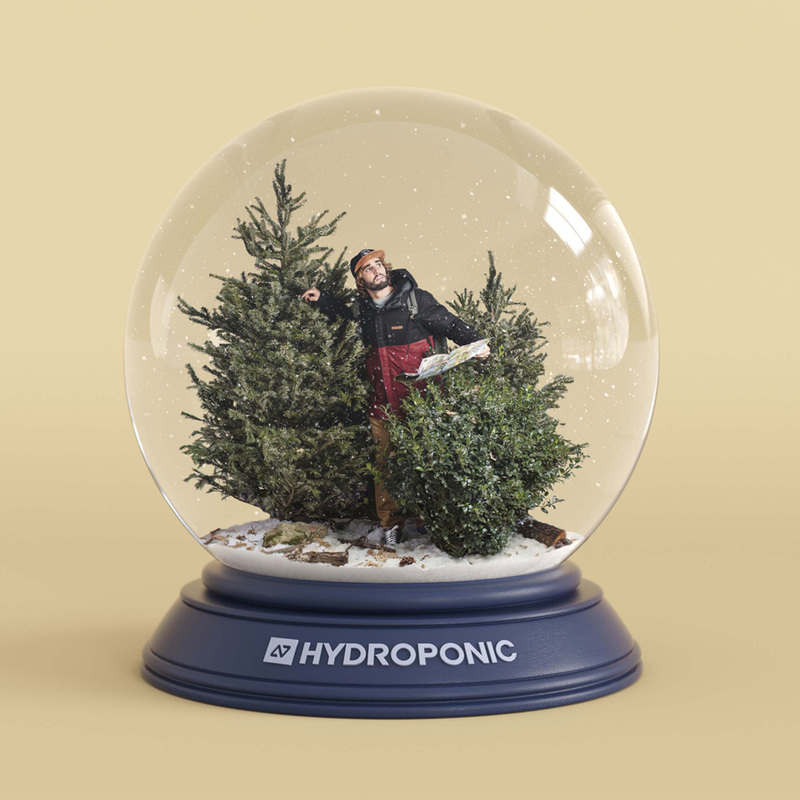 We introduce the Hydroponic X BCN Wax Collab Surf Skate, which comes with a FREE BCN Wax bar to celebrate the Barcelona-based brand get-together. The Concrete is a 10 inches wide classic ‘Pig’ deck with very flat nose, very little concave and a slight diamond tail, while the Classic is a surfboard-simulated board with Fish Tail and a white dip paint job that makes it an absolute beauty to own and add to your quiver. 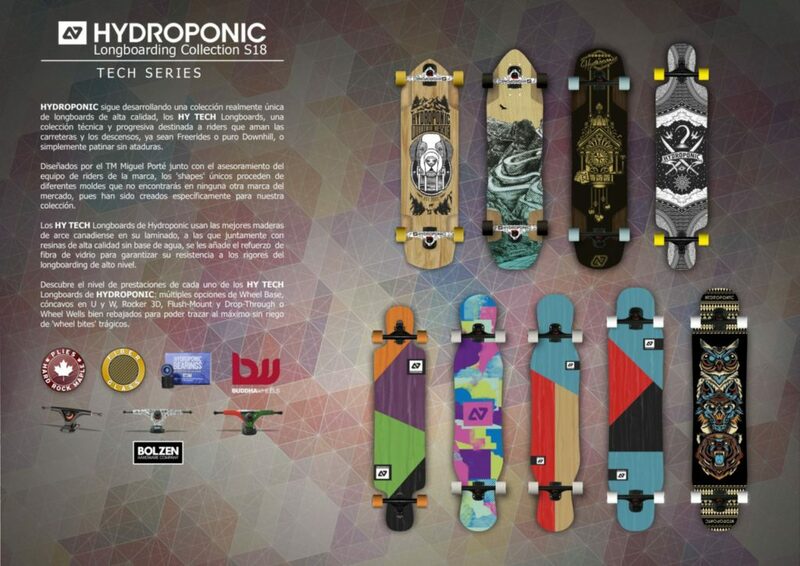 -The Hydroponic line up is big with cruisers. The Polar Tattoo is a dip deck that uses Inverted 150 mm trucks for a greater sense of turning and carving (and it also comes in Surf Skate mode if you prefer so), and the Arrow is a short board with a nice 3-ply cut job and a layer of Fiber Glass at the bottom. There are plenty of other options too if you wish for a shorter or longer deck. 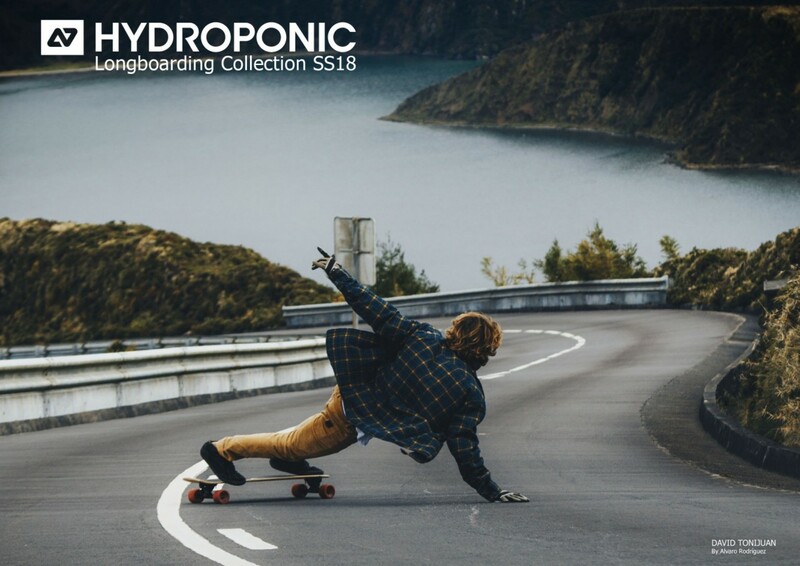 -The Hydroponic Tech Longboards feature DH, Freeride and Drop-Through, and Dancing decks with different combinations of plies, Fiber Glass, wheel base, trucks and wheels. Find your beast! 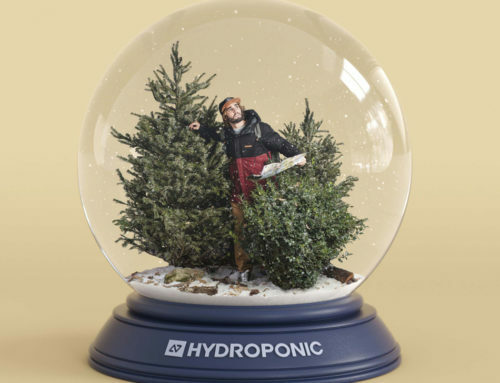 The full Hydroponic Longboarding Catalogue is also filled with Hardware options, from Bearings to a vast array of tools, griptape, gloves and so on.